Nestled back off Markham across the street from the sprawling campus of the University of Arkansas for Medical Sciences (UAMS), sits a quiet, almost unnoticeable building that looks not unlike a miniature hotel. Upon ringing the doorbell, you’re likely to meet Gina Newman, Executive Director of Family Home, a nonprofit that has called Little Rock home for over a decade. Back in the early 2000s, the founding board got together with local lawyer Sam Perroni at the helm with a goal of opening a Ronald McDonald House to serve Little Rock. The Ronald McDonald House is a national charity that aims to keep families near their children who are hospitalized far from home. When Perroni and his team tried to get one started in Little Rock, however, they ran into some roadblocks, but kept trying. They did finally get the Ronald McDonald House opened near Arkansas Children’s Hospital, and shortly thereafter Perroni’s good friend from the Cancer Institute at UAMS approached him about a similar need. They formed a new board, and while they were initially focusing on cancer patients, NICU families also came to the forefront. “The quicker NICU babies can take their mother’s milk, they have a 50 percent greater survival rate,” Newman explains. Since then, Family Home has operated with a mission to provide affordable lodging in a homelike setting for cancer patients and parents of premature infants being cared for at the UAMS Medical Center. The organization also works to provide a cancer support center where education, fellowship and nurturing can take place in a supportive atmosphere. Up until 2016, there wasn’t a truly designated executive director, but when Newman had the opportunity to sign on, she felt drawn to the cause. There are 15 rooms in all, five on the first floor designated for parents of premature children, and 10 on the second floor designated for cancer patients. For every five rooms, there is a kitchen area, complete with everything an individual might need to prepare meals. 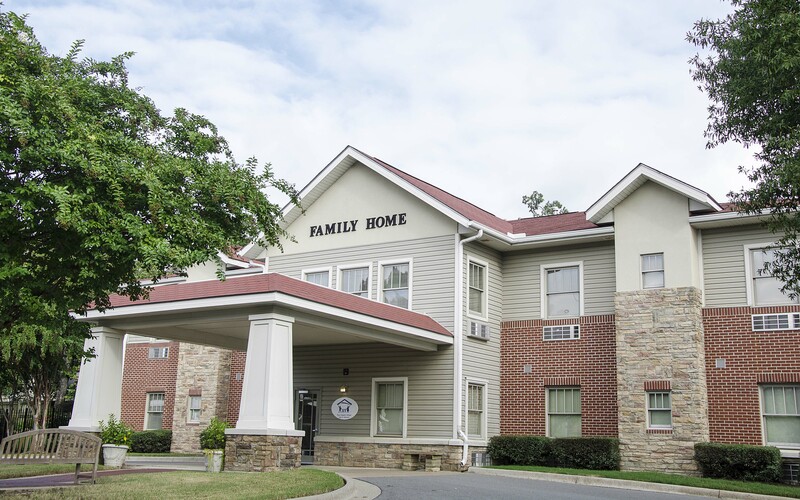 Since opening, Family Home has served people from over 35 states, seven countries, and all over Arkansas. Some patients are able to pay the $10 a night fee, while others qualify for aide through the Cancer Institute and other programs. “When they’re here for a long time – especially last summer – they become family,” Newman says. Often those that stay longer have a want to give back. Family Home is able to run smoothly because of all those involved – from the hardworking board to the many former-patient-turned-volunteers, there is no shortage of passion behind the project. As far as fellowship goes, the building houses a shared-use area on the first floor that plays host to a meeting space for various groups, including a local blood cancer support group, a group focusing on handling child loss, as well as Care Caps. Care Caps was originally started by Mary Phillips out of Heber Springs, Ark. She and her team of volunteers meet at Family Home once a month and sew special caps with a handwritten note for cancer patients. “She comes in on Sunday night and has about 10 or more sewing machines, as well as an ironing station […] It’s like an assembly line or a mini factory she goes to five or six different places over the state,” Newman says. From Care Caps and beyond, Family Home houses more than those recuperating from treatment or families waiting to hear about their newborn in the NICU. The building houses a community. And, with nearly all original floors, furnishings, and appliances, there’s always something that needs attention. Which is why the board first introduced their big seasonal fundraiser – Monster Bash – some 16 years ago. Newman explained, “The Monster Bash started before we opened.” This year’s event takes place on Friday, Oct. 26 at Next Level Events, with the proceeds going toward Family Home as well as the NICU at UAMS. The tickets cost $50 for ages 21 and up. The party celebrates the season – Halloween to be exact – with a costume contest, silent and live auction and hors d’oeuvres. If you can’t make the event but want to give back, Family Home recently started a room sponsorship program called, “A Room For Hope.” For $60 a month, you can cover the cost of a room for patient patients or the family of a premature baby. Each room then represents the nameplate of the donor. In this instance, a little goes a long way.